For the film, see The Mailbox (film). Mailbox Birmingham (also known as The Mailbox) is an upmarket shopping and office development in the city centre of Birmingham, England. It serves as the base for BBC Birmingham and houses one of seven Harvey Nichols department stores in the United Kingdom. The main entrance was located at Blucher Street beneath a tower set between a square block for parcels on the left and a lower block for the letters sorting office on the right. The structure consisted of a steel frame on a 40-foot (12 m) square grid with lightweight pre-cast concrete floor slabs and reinforced concrete retaining walls and sub floors. The exterior was clad with cast glass troughs and exposed aggregate panels. Ventilation was provided through air-handling units which provided the building with the temperature it required. Extract fans were also placed on the roof. The exterior consisted mainly of the glass slabs and projecting air handling units with recessed windows. The Royal Mail sorting office was recognised by Chatham in 1997. [clarification needed] Chatham had been an important figure in the regeneration of Birmingham, working with Argent to develop Brindleyplace. He found out that the sorting office was to be sold and tried to convince Argent about the potential the building offered if it were to be converted into a mixed-use building. Argent was unconvinced and so Chatham decided to establish his own development company, Birmingham Development Company, and purchased the building in 1998 for £3 million. He also paid a further £1 million for the surrounding waterfront buildings. Soon after purchasing the building, he sold the air-rights to Crosby Homes, providing him with further money for redeveloping the building. The building was converted by the Birmingham Development Company and designed by the RIBA award winning, Birmingham practice, Associated Architects. It was to include two hotels with a total of 300 rooms, 15,850 sq. m (170,000 sg. ft.) of office space, 9,290 sq. m (100,000 sq ft.) of retail space and a similar area for restaurants and a health club. Crosby Homes constructed apartments above the space. The redevelopment of the sorting office involved demolition of all but the steel sub-structure. It cost £150 million overall and opened in December 2000. Following the purchase of two retail units by Harvey Nichols, the development was valued at over £125 million. A public square the size of Chamberlain Square[clarification needed] was created to the front of the Mailbox beneath Suffolk Street Queensway. It was paved with natural stone and as well as being a social area, it was also designed to allow the easy movement of visitors to, from and around the building. The area to the rear of the building is used frequently by the public. At the back of the Mailbox a walkway leads over a bridge and to the canal towpaths near Gas Street Basin. A mixed-use building called the Cube, designed by Birmingham born architect Ken Shuttleworth's practice Make Architects with Buro Happold engineers forms the final phase of the Mailbox development and houses a rooftop restaurant, boutique hotel and residential flats. In 2004, BBC Birmingham moved into a new complex of studios at the Mailbox that replaced the previous Pebble Mill site in Edgbaston. The general public is able to watch radio and television broadcasts being made at an all-access public foyer, as well as surf the BBC website and purchase BBC merchandise. On 31 October 2005, 81-year-old actress Mary Wimbush died at the Mailbox studios shortly after a recording session for The Archers. On 16 February 2008, a shooting incident took place at Cafe Lazeez at the Mailbox. In April 2011 the Mailbox was sold for £127.1 million to a joint venture between Brockton Capital and Milligan. On 30 May 2013, Milligan Retail announced that the Mailbox would undergo a major renovation, designed by Sterling Prize winners Stanton Williams, which would see a roof installed over the shopping complex's atrium. The anchor store, Harvey Nichols, would double in size to over 45,000 sq. ft. 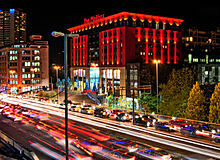 It was also announced that Brockton Capital and Milligan would work in co-ordination with Birmingham City Council to improve the public area reaching from the underpass beneath Suffolk Street Queensway to the front of Mailbox. These changes would be implemented to complement the redevelopment of New Street station which will house a full-line John Lewis department store. On 29 November 2013, it was announced that Everyman Cinemas would take space at the Mailbox, opening a 12,000 sq. ft 3-screen cinema in the latter part of 2014, ahead of the completion of the whole scheme in 2015. L.K.Bennett, Jaeger and Gieves and Hawkes will also open in the redeveloped centre in 2015 whilst an improved way-finding system will be introduced to improve shoppers' experience. In October 2017, the ground floor of the complex saw the opening of several homewares stores including: Heal's, made.com, BoConcept and Wesley Barrell, which joined SieMatic. ^ a b Douglas Hickman (1970). Birmingham. Studio Vista Ltd. p. 93. ^ a b c d Andrew MacLaran (2003). Making Space: Property Development and Urban Planning. Oxford University Press US. p. 207. ISBN 0-340-80827-6. ^ "Archers star Wimbush dies at 81". BBC News. 1 November 2005. Retrieved 2007-11-10. ^ "'Shots fired' in city restaurant". BBC News. 2008-02-16. Retrieved 2008-03-29. This page was last edited on 7 June 2018, at 07:52 (UTC).